Since it was my birthday Tuesday, everyone has been asking me if I was making my own cake or if someone was making one for me… I always replied that I was making one for myself, but what I left out was I wasn’t making cake. Why, you might ask… Well, ready for my confession? I don’t really like cake. I wouldn’t say I dislike it… but there are just so many other desserts I would much rather have then cake. I shouldn’t say all cakes, I love lava cake and angel food cake. But normal white cake with frosting just doesn’t make sense to me, or cupcakes for that matter. Honestly, I don’t see what the fuss is about. If I’m gonna have a dessert, give me something decadent with tons of flavor. Something that gives me the urge to lick it off my plate. But, since it was my birthday, I didn’t want to make something to pain-stakingly tiresome like creme brulee. One of my favorites, btw!! So I decided to make something a little easier. Not that home made ice cream is easy, but it is one of my favorites, so in the end this is what I made as my birthday cake. I have been curious about the flavor of butterbeer since I saw it on Harry Potter, and I don’t know if the cream soda was suppose to be the flavor of butterbeer or if it was the butterscotch, but all I have to say about this dessert is wow!! It’s basically a butterscotch blondie with vanilla cream soda ice cream and butterscotch ganache. Huh!! It is so good! The ice cream is what takes the longest because you need to give it time to cool, and then freeze it. So this dessert takes about 2 days cause of that, but the blondie and ganache are actually really simple, and everything is to die for!! So yummy! In a small bowl, gently beat the egg yolks; set aside. In a medium sauce pan over medium heat, stir together the cream soda, brown sugar, butter, vanilla, and butter flavoring. 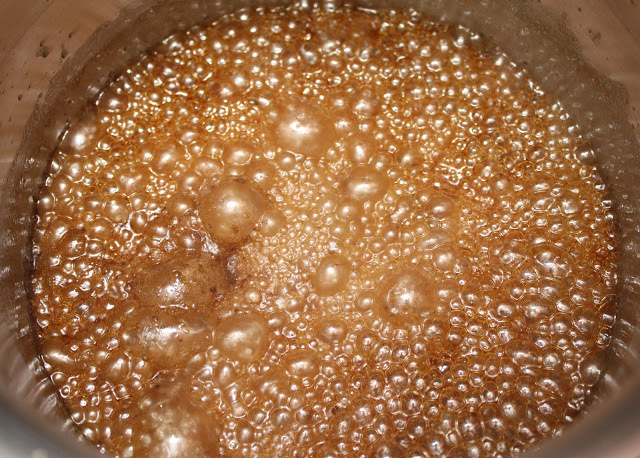 Heat until butter is melted and sugar is dissolved, then allow the mixture to bubble for one minute (stir frequently as the carbonation will cause extra bubbling). Stir in 1/2 cup of cream until mixed thoroughly; remove from heat. Temper the egg yolks, then add to mixture slowly while whisking constantly. Add the remaining cream and buttermilk and whisk until combined. Allow to cool then chill in the refrigerator for at least two hours or overnight. Pour the chilled mixture into an ice cream maker and freeze according to manufacturer’s directions until it reaches “soft-serve” consistency. Transfer ice cream to a one- or two-quart lidded plastic container; cover surface with plastic wrap and seal with lid. For best results, ice cream should ripen in the freezer for at least 2 hours of overnight. Serve over blondies and with butterscotch ganache (recipes below). Preheat the oven to 325 degrees and spray on 8×11″ baking dish cooking spray (you can use a 9×13″ pan; just reduce the baking time by about 10 minutes or so). In a medium bowl, whisk together the flour, baking soda, and baking powder. In a large bowl, cream together the butter and sugars until smooth. Add in the egg and beat for one minute. Beat in the cream soda and vanilla, and then gradually beat in the dry ingredients just until combined. Using a rubber spatula, fold in the butterscotch chips. Spoon the batter into the dish on spread evenly. Bake 40-50 minutes or until a knife inserted in the center comes out mostly clean (the inside will still be very gooey, and the top is golden brown. Transfer the pan to a wire rack to cool completely before cutting into bars. Heat the butterscotch and heavy cream over a double boiler until the chips just start to melt. Remove from heat and stir until completely melted. Allow to cool slightly before drizzling over ice cream. Butterbeer Blondies recipe from Sugar Crafter and Butterbeer Ice Cream and Ganache recipes from The Spiffy Cookie.